In this day and age you never know what to expect when you have to call a store or company for information. Automated systems, press the number to reach x, y, and z, endless directories leading to nowhere, give me your mother’s maiden name and the first initial of the best man at your wedding…and that is all BeFoRe speaking to a real live person! You can easily spend the 10 minutes you set aside in your day to take care of what seemed like a simple task just trying to get through to talk to an actual human being. 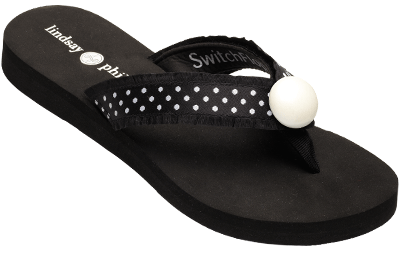 Last summer I bought an AdoRaBle pair of Lindsay-Phillips SwitchFlops (flip-flops that have removable straps that can be changed to match any outfit) that wore out in the toe on one shoe. Since I had invested in the SwitchFlops and a variety of straps to coordinate with different outfits I was upset that the shoes only lasted half a season. I went onto the website and looked up the phone number for customer service. I left a message explaining the situation with my shoe and was pleased to receive a call back within a day. Not only was the woman who I spoke with friendly and helpful, but since the pair of SwitchFlops that I purchased last season was no longer available she let me pick out TwO pairs in place of the pair that I had! How’s that for customer service?!!! In this fast paced, high-tech world we live in, it is nice to be reminded that there are still smaller companies out there that DO take the time to put their customer’s satisfaction first. I love your style Robyn and look forward to you doing more fashion related posts! !